Life is a constant battle against entropy or disorder. Cars break down; they don’t repair themselves. Left to themselves, files, books, and ideas become disorganized. Organizations and the knowledge workers inside them are engaged in a constant, but doomed, fight against entropy; the order they bring is always temporary. Knowledge management is one of many disciplines engaged in that fight. If entropy is destined to win, what does that tell us about how to carry on the fight? It reminds us that perfection is the wrong goal. You can’t define a perfect taxonomy; 100% compliance with the documentation standards is wasted effort; there will always be something more pressing than the paperwork. This matters because the personalities attracted to the apparent orderliness of knowledge management tend to be seekers of this impossible perfection. You want to temper that predisposition, not feed it. Surrendering to disorder isn’t a good strategy either. Let the reality of entropy shape our strategies and practices. There are things we should worry less about and things we might better do differently. We should worry a lot less about perfection and completeness and strive instead for a standard of “good enough”. That requires more judgment and sensitivity to unique circumstance than most organizations—and many individuals—are comfortable with. Black and white makes for easier, albeit impossible, compliance standards and management. If you are in a position to shift an organization in the direction of more gray, encourage that. If you are enmeshed in unrealistic organizational expectations, strive for only as much compliance as will keep the auditors and censors at bay. I’m not advocating open rebellion, or even mild “civil disobedience”; simply be comfortable that you have the laws of physics on your side while you quietly ignore stupider requirements. 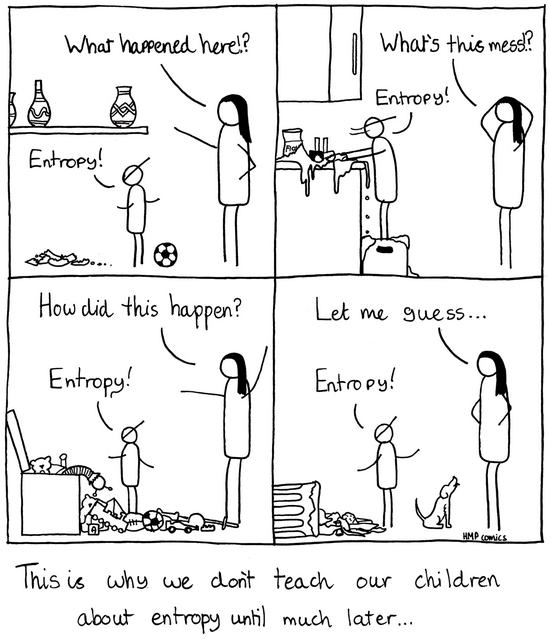 If entropy is the law, how might you operate differently? Learn where small efforts now postpone or eliminate major remediation efforts. Whatever you opt to do now, you are going to live with that choice later. Make your choices with that appreciation of a disorderly later. You are never going to go back later to add the appropriate tag, improve the name of the file, or reorganize the project team’s directories. Recognize the places and moments where a tiny injection of order now will pay lasting dividends. Don’t pretend that you can get organized after the press of the immediate has passed. Entropy is inevitable. As a knowledge worker, your task is to create pockets of order out of the noise. As you create those pockets, don’t increase the noise everywhere else. Thanks for sharing this witty post on the difference between “perfection” and “good enough”. I completely agree with your views- you have to be unique not perfect. Its all about maintaining the equilibrium.